When the Motorola Atrix 4G first came out with its “qHD” display, we were all expecting it to be the second coming of some religious figure, but after being analyzed by sites like AnandTech, the term “PenTile” was brought into the light and quickly became the downer it word of the moment. So naturally, when the DROIDX2 (our hands-on) was released to Verizon and sporting that same “qHD” display, we started digging into it to see what we could find. So what is a PenTile screen? Without being the all-knowing guru on display technology, I’ll have to pull from some other sources on this one and recap. The theory (as I understand it) behind using a PenTile grid is simply to give you a brighter display at a lower cost with a perceived bigger resolution, and one that also consumes less power. In the case of a cell phone, this has “win” written all over it, right? Well, not necessarily. You’ll notice on a PenTile screen that certain colors won’t display correctly. Such is the case of the DX2 or Atrix which use a RGBW layout – the pixels have to constantly fight with each other to produce the correct color that you should be seeing. You may also struggle to view black text over white backgrounds on websites when zoomed all the way out or find yourself with a headache after quickly scrolling. And then there is the fact that everything tends to look a little grainy. It’s very difficult for a Pentile RGBW display to produce straight lines, some times leaving spots with an almost jagged (or grainy) edge to them. At the same time though, you are getting a higher resolution and a supposed sharper image (from a distance), which some would consider a nice trade-off. To give you a bit of reference to all of this though, here is a macro shot of the DROIDX2, DROIDX and Nexus S all taken in the same light, at about the same time and angle. The Nexus S wins in color quality, but the original DROIDX appears to be leading the way in clarity. The DX2 on the other hand, just looks odd and grainy with that PenTile grid. 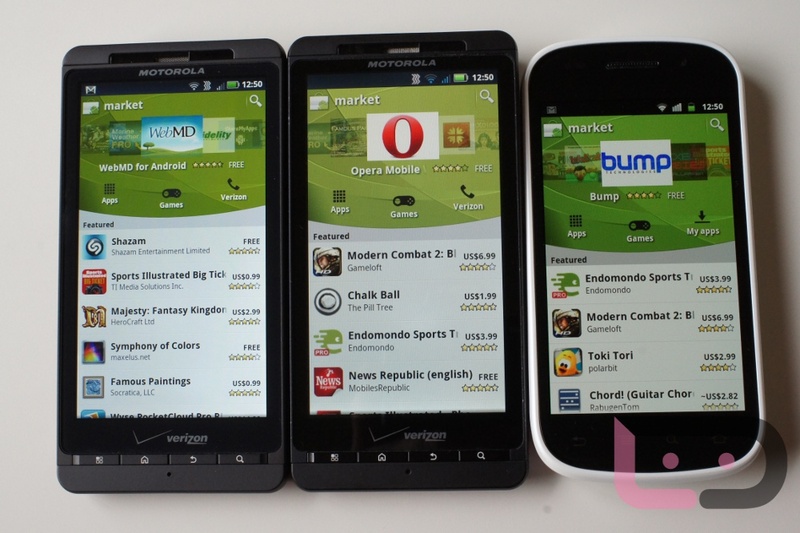 In fact, the green of the Android Market almost looks brown when you compare it to the other devices. We also pulled up this site to see the three phones display against a green background with a variety of colored texts. None of the devices struggled to pull up all of that green, but the DX2 was unable to even display the page correctly do to its grid. Final thoughts? The PenTile (qHD) screen is really not the devil of smartphone displays (actually it is). Sure, it looks awful under a macro lens (something normal people shouldn’t care about), can’t render certain bright green webpages, and may even give you a headache if you zoom all the way out on a web page, but that doesn’t mean it has zero benefits. Many would take this any day if it were to provide a better battery life and brighter/clearer viewing in an outdoor setting, which it does. I think the real story here is that “qHD” is another of this year’s marketing gimmicks by Motorola to brag about a higher resolution screen to compete with you-know-who, when it’s pretty obvious here that they are cutting a corner to make those dual-core processors last more than 3 hours without having to increase the price of their phones. Should you avoid qHD screens? No, not at all Probably. And to be clear, I haven’t been dissatisfied with the screen on the DROIDX2 by any means, but instead wanted to point out exactly what it is. Just know that there are some minor drawbacks, which you should be aware of. And hopefully this post will allow you to realize those and then decide if they are for you or not. Update: After spending a lengthy amount of time (our review) with the DROIDX2 after writing this post, we can conclude that this might be one of our least favorite screens of all time. qHD to Motorola is indeed just a marketing term, because this screen is no where near HD-quality. You can see pixels on the device with a naked eye, colors are never correct, and the instant head pounding that you receive while scrolling through anything is something I’ve never seen from another phone. It’s not pretty in the Moto PenTile world.